Zegordi, S., Mokhlesian, M. (2015). Coordination of pricing and cooperative advertising for perishable products in a two-echelon supply chain: A bi-level programming approach. Journal of Industrial and Systems Engineering, 8(4), 38-58. Seyed Hessameddin Zegordi; Maryam Mokhlesian. "Coordination of pricing and cooperative advertising for perishable products in a two-echelon supply chain: A bi-level programming approach". 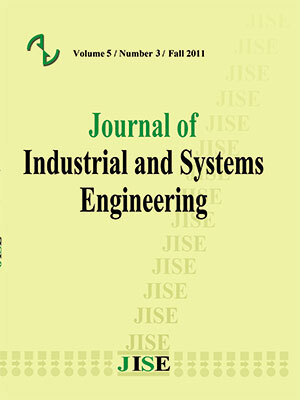 Journal of Industrial and Systems Engineering, 8, 4, 2015, 38-58. Zegordi, S., Mokhlesian, M. (2015). 'Coordination of pricing and cooperative advertising for perishable products in a two-echelon supply chain: A bi-level programming approach', Journal of Industrial and Systems Engineering, 8(4), pp. 38-58. Zegordi, S., Mokhlesian, M. Coordination of pricing and cooperative advertising for perishable products in a two-echelon supply chain: A bi-level programming approach. Journal of Industrial and Systems Engineering, 2015; 8(4): 38-58. Department of Industrial Engineering, TarbiatModares University, Tehran, Iran. In this article the coordination of pricing and cooperative advertising decisions in one-manufacturer one-retailer decentralized supply chain with different market power for channel members is studied. The products are both perishable and substitutable. The problem is modeled as a nonlinear bi-level programming problem to consider both retailer and manufacturer decisions about prices and advertisement expenditure as well as the amount of retailer’s purchase. An Improved Particle Swarm Optimization through combining PSO by local search and diversification is proposed to solve the model. Finally, a numerical example is presented to analyze the effect of market scale. Also the role of the values of coefficient of price elasticity on decisions is studied via the numerical example. Numerical results indicate that to raise profit when the consumers are more price-sensitive, both the manufacturer and the retailer should decrease their prices and increase their advertising expenditure. In the larger market scale, the manufacturer and the retailer are even permitted to increase their prices to gain more profit. Abad, P.L.(1996). Optimal pricing and lot-sizing under conditions of perishability and partial backordering.Management Science,42(8), 1093–1104. Aust, G., &Buscher, U.(2012). Vertical cooperative advertising and pricing decisions in a manufacturer-retailer supply chain: A game-theoretic approach.European Journal of Operational Research,223, 473-482. Berger, P.D.(1972). Vertical cooperative advertising ventures.Journal of Marketing Research,9,309–312. Bisi, A.,& Dada, M.(2007). Dynamic learning, pricing, and ordering by a censored newsvendor.Naval Research Logistics,54(4), 448–461. Burnetas, A. N.,& Smith, C.E.(2000). Adaptive ordering and pricing for perishable products.Operations Research,48(3),436–443. Chew, E.P., Lee, C.,& Liu, R.(2009). Joint inventory allocation and pricing decisions for perishable products.International Journal of Production Economics,120, 139–150. Chew, E.P., Lee, C., Liu, R., Hong, K.S.,& Zhang, A.(2014). Optimal dynamic pricing and ordering decisions for perishable products.International Journal of Production Economics. 157, 39-48. Chu, W.,&Messinger, P.R.(1997). Information and channel profits.Journal of Retailing,73(4), 487–499. Corbett, C.J., Zhou, D.& Tang, C.S.(2004). Designing supply contracts: Contract type and information asymmetry.Management Science,50(4), 550–559. Crimmins, E.C. (1970).A management guide to cooperative advertising. Association of national advertisers: New York. EI-Ansary, A.L.&Stern, L.W.(1972). Power measurement in the distribution channel.Journal of Marketing Research,9(1), 47–52. Ertek, G.,& Griffin, P.M.(2002). Supplier- and buyer-driven channels in a two-stage supply chain.IIE Transactions,34(8), 691–700. Gallego, G.,&van Ryzin, G.(1994). Optimal dynamic pricing of inventories with stochastic demand over finite horizons.Management Science,40(2),999–1020. Gao, Y., Zhang, G., Lu, J.,& Wee, H.M.(2011). Particle swarm optimization for bi-level pricing problems in supply chains.Journal of Global Optimization,51,245-254. Hicks, C.R. (1993).Fundamental concepts in the design of experiments.4th ed., Oxford University Press: New York. Hu, T., Guo, X., Fu, X.,&Lv, Y.(2010). A neural network approach for solving linear bilevel programming problem.Knowledge-Based Systems,23,239–242. Huang, Z.,&Li, S.X.(2001). Co-op advertising models in manufacturer–retailer supply chains: A game theory approach.European Journal of Operational Research,135,527–544. Huang, Z., Li, S.X.,& Mahajan, V.(2002). An analysis of manufacturer–retailer supply chain coordination in cooperative advertising.Decision Sciences,33,469–494. Hutchins, M.S. (1953).Cooperative advertising. Ronald Press: New York. Ingene, C.A.,& Parry, M.E.(2007). Bilateral monopoly, identical distributors, and game-theoretic analyses of distribution channels.Journal of the Academy of Marketing Science,35, 586-602. Jia, J.,&Hu, Q.(2011). Dynamic ordering and pricing for a perishable goods supply chain.Computers & Industrial Engineering,60,302–309. Khouja, M.,&Robbins, S.S.(2003). Linking advertising and quantity decisions in the single-period inventory model.International Journal of Production Economics,86,93–105. Kuo, R.J.,&Huang, C.C.(2009). Application of particle swarm optimization algorithm for solving bi-level linear programming problem.Computers and Mathematics with Applications,58,678-685. Lan, K. M., Wen, U. P., Shih, H. S.,& Lee, E.S. (2007).A hybrid neural network approach to bilevel programming problems.Applied Mathematics Letters,20,880–884. Li, G., Xiong, Z., Zhou, Y.,&Xiong, Y.(2013). Dynamic pricing for perishable products with hybriduncertainty in demand.Applied Mathematics and Computation,219(20), 10366-10377. Lu, J., Shi, C.,&Zhang, G.(2006). On bilevel multi-follower decision making: General framework and solutions.Information Sciences,176,1607–1627. Mokhlesian, M., &Zegordi, S.H. (2014). Application of multidivisional bi-level programming to coordinate pricing and inventory decisions in a multiproduct competitive supply chain. Int J AdvManufTechnol, 71, 1975–1989. Rajan, A., Steinberg, R.,&Richard, S.(1992). Dynamic pricing and ordering decisions by a monopolist.Management Science,38(2), 240–262. Rajesh, J., Gupta, K., Kusumakar, H.S., Jayaraman, V.K.,&Kulkarni, B.D.(2003). A tabu search based approach for solving a class of bilevel programming problems in chemical engineering.Journal of Heuristics,9,307–319. Roslow, S., Laskey, H.A.,& Nicholls, J.A.F.(1993). The enigma of cooperative advertising.Journal of Business & Industrial Marketing,8,70–79. Somers, T. M., Gupta, Y.P.,&Herriott, S.R.(1990). Analysis of cooperative advertising expenditures: A transfer-function modeling approach.Journal of Advertising Research, (October-November), 35-45. Szmerekovsky, J.G.,&Zhang, J.(2009). Pricing and two-tier advertising with one manufacturer and one retailer.European Journal of Operational Research,192(3),904–917. Talbi, E.G. (2009).Metaheuristics: from design to implementation. John Wiley & Sons, Inc., Hoboken: New Jersey. Tsay, A.A.(2002). Risk sensitivity in distribution channel partnerships: Implications for manufacturer return policies.Journal of Retailing,78(2), 147–160. Wang, G., Wang, X., Wan, Z.,&Jia, S.(2007). An adaptive genetic algorithm for solving bilevel linear programming problem. Applied Mathematics and Mechanics, (English Edition)28(12),1605–1612. Wang, Q.(2002). Determination of suppliers’ optimal quantity discount schedules with heterogeneous buyers.Naval Research Logistics,49(1), 46–59. Xie, J.,&Ai, S.(2006). A note on ‘‘Cooperative advertising, game theory and manufacturer–retailer supply chains”.Omega,34,501–504. Xie, J.,&Neyret, A.(2009). Co-op advertising and pricing models in manufacturer–retailer supply chains.Computers & Industrial Engineering,56,1375–1385. Xie, J.,&Wei, J.(2009). Coordinating advertising and pricing in a manufacturer–retailer channel.European Journal of Operational Research,197,785–791. Yan, R.(2010). Cooperative advertising, pricing strategy and firm performance in the e-marketing age.Journal of the Academy of Marketing Science,38,510–519. Yue, J., Austin, J., Wang, M.C.,& Huang, Z.(2006). Coordination of cooperative advertising in a two-level supply chain when manufacturer offers discount.European Journal of Operational Research,168,65–85. Zhang, J., Gou, Q., Liang, L.,& Huang, Z.(2013). Supply chain coordination through cooperative advertising with reference price effect.Omega,41(2),345-353. Zhao, J., Tang, W.,& Wei, J.(2012). Pricing decision for substitutable products with retail competition in a fuzzy environment.International Journal of Production Economics,135(1),144-153.